Alicia Kwande talks with those experiencing homelessness, on the main level of the Penrose Library in Colorado Springs. The Pikes Peak Library District has recently hired Kwande, a social worker, to work with people experiencing homelessness who frequent the Penrose Library. COLORADO SPRINGS (AP) – Alicia Kwande works in a Colorado Springs library, but she isn’t here to talk about overdue books. 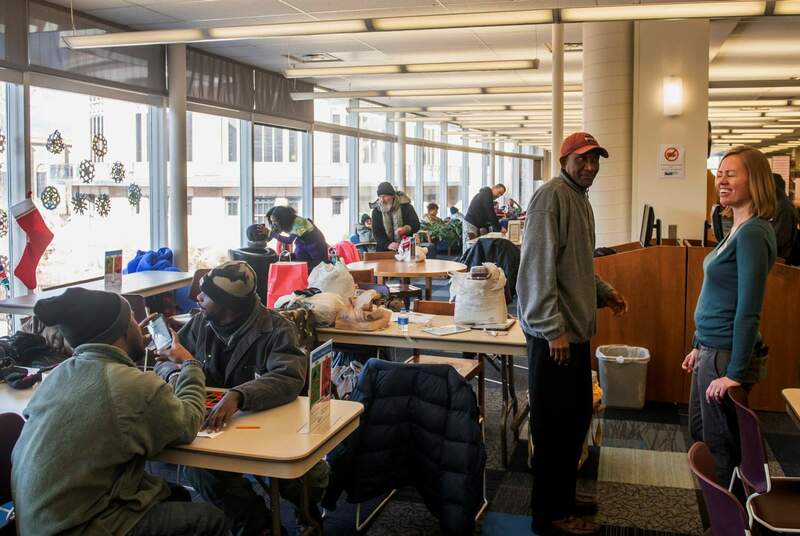 Count Kwande among the newest additions to the Pikes Peak Library District – a social worker whose sole job is to help homeless and low-income visitors ease their struggles, the Colorado Springs Gazette reports. She’s the latest of several social workers hired by libraries across the Front Range – including in Denver, Jefferson and Arapahoe counties – to help visitors find a home in which to enjoy their borrowed books. “This is drastic – 5 degrees, and that’s not including the wind,” said Taylor, 39, bundled in a puffy black coat after having spent the night sleeping outside. “A library – our doors are open to everyone,” Spears said. “And it’s an unusual situation for someone who’s not homeless to be confronted with standing in line with someone who is homeless to check out a book. Or looking and the only seat available is next to a homeless person. That’s not a situation that most people find themselves with. And there’s a lot of discomfort in that. She became homeless a few months ago when her apartment building near the Olympic Training Center was sold, and each tenant was told to leave. Now, she sleeps outside downtown beside a building near the El Paso County courthouse, while trying to find a new place to live.